Hey I thought you LJs might enjoy my approach to spoon sculpting. If I could figure out some sort of good active dust collection design, that would make this quite a bit more usable. A little bit of compressed air will make things new again. That will add more fiber to any bread you make. I’m going to tell my wife she can have a new Kitchen Aid if I can use it too…..
Not if its Festool, you could buy 2 or 3 Kitchenaids for the price of some Festool sanders. plus if i used the wifes mixer id have to go out and get her a new one because she would never use it again. 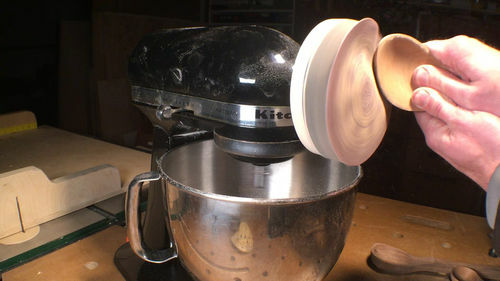 Show me a sander that accomplishes what this KitchenAid does. All benchtop sanders I have burn end grain and do not flex around outer contours of spoons. I like the idea. I would think you could do the same thing with an electric motor set to run at a similar speed as the Kitchen Aid and you could attach a vacuum hood to capture the dust.